This is the view from my kitchen window. 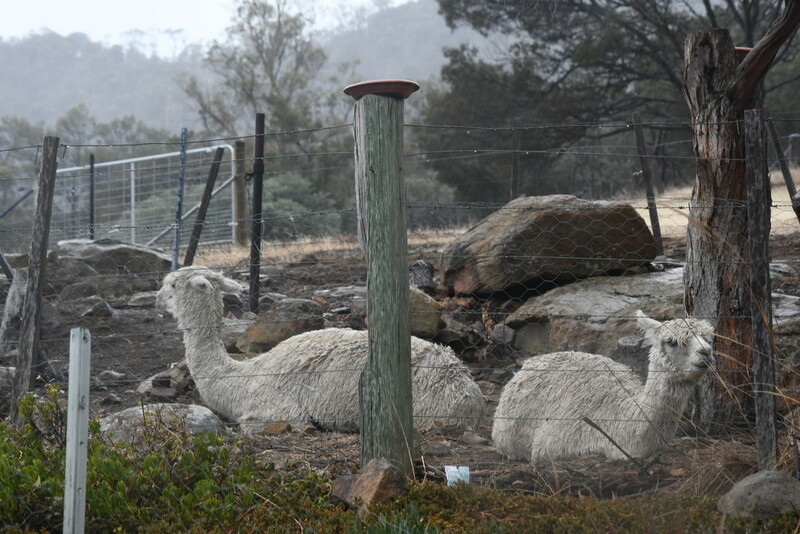 The alpaca's are sitting down in our first paddock behind the house, where they are sheltered from the blasting winds we are currently experiencing. They do have a shelter to go to, but right now they are not inclined to use it. Alpaca's are fun to watch! Do you know their names? Are they friendly? We have some up the street and I want to go take pictures of them, but I don't have enough nerve to ask the property owners! LOL!! @jenp Jennifer, they are our alpaca's so yes I know their names. We call these two Henri and Bob. Our alpaca's are extremely friendly. We live on acreage at the end of a dead end street, but I have to say if some one asked to take photos of our alpaca's I would be happy to let them. I also often stop and photograph other peoples sheep and alpacas etc from a road side if I see them, without asking. I say go for it and ask if you can photograph the alpaca's if you can't do it from the roadside. I hope to see your photos one day soon. @yorkshirekiwi our Alpaca's hardly ever use their shelters! @kgolab - love their names!! I cant stop on the roadside where they are. Sharp curve and no shoulder. One day, if I see the owners outside, I think I'll stop and ask. I'd have to pull into their property to take pictures. But I have loved driving by them for years. They always look happy and like they have some funny personalities! @jenp Alpaca's definitely have their own personalities, we also have a third one called Jeffrey. He is the most friendly one of the three.